Come dressed in your croquet best – These Two Eyes! 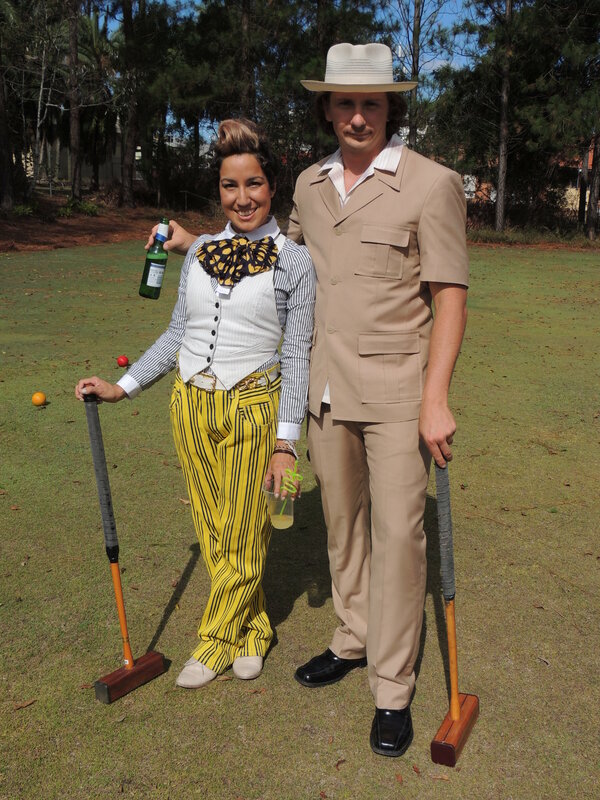 Come dressed in your croquet best, or it’s off with your head! ‘Get to your places!’ shouted the Queen in a voice of thunder, and people began running about in all directions, tumbling up against each other; however, they got settled down in a minute or two, and the game began. Alice thought she had never seen such a curious croquet-ground in her life; it was all ridges and furrows; the balls were live hedgehogs, the mallets live flamingoes, and the soldiers had to double themselves up and to stand on their hands and feet, to make the arches.” – Alice and Wonderland, Lewis Carroll. My first croquet experience wasn’t nearly as abstract as the game played in Lewis Carroll’s Alice in Wonderland. The mallets were traditional square or round pieces of wood, the balls colored blue, red, black and yellow, and the arches white metal posts. There was no Queen running around screaming “off with your head” in a jealous rage, but there was definitely merriment being celebrated for Nidya and John’s 29th birthdays. I wasn’t sure what to expect when the invitation called for a game of Gin and Croquet on a Sunday afternoon. 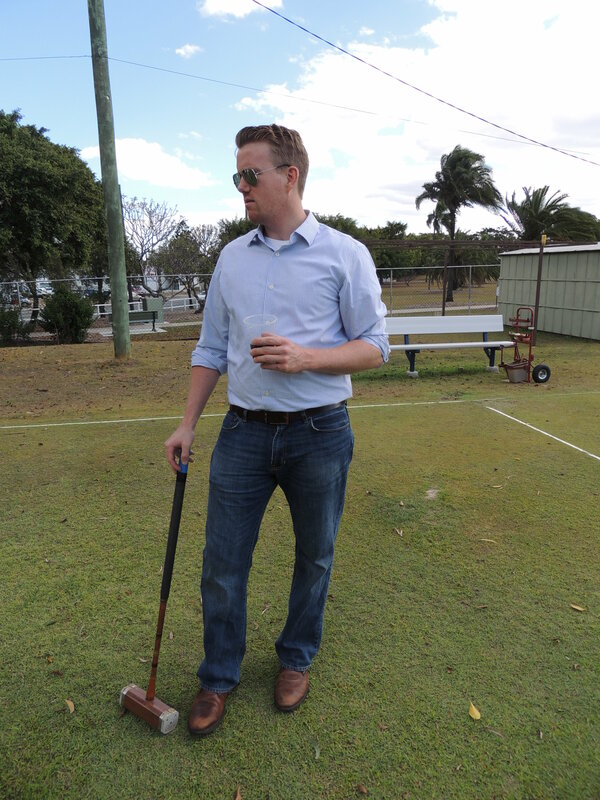 I don’t drink gin and I’ve never played croquet, but there’s always a first for everything. 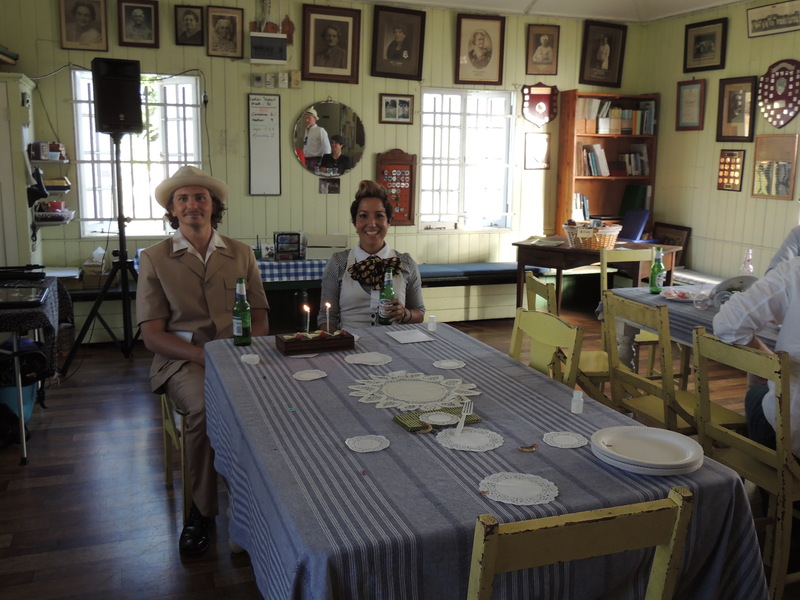 To make the day even more exotic, guests were invited to dress to impress. 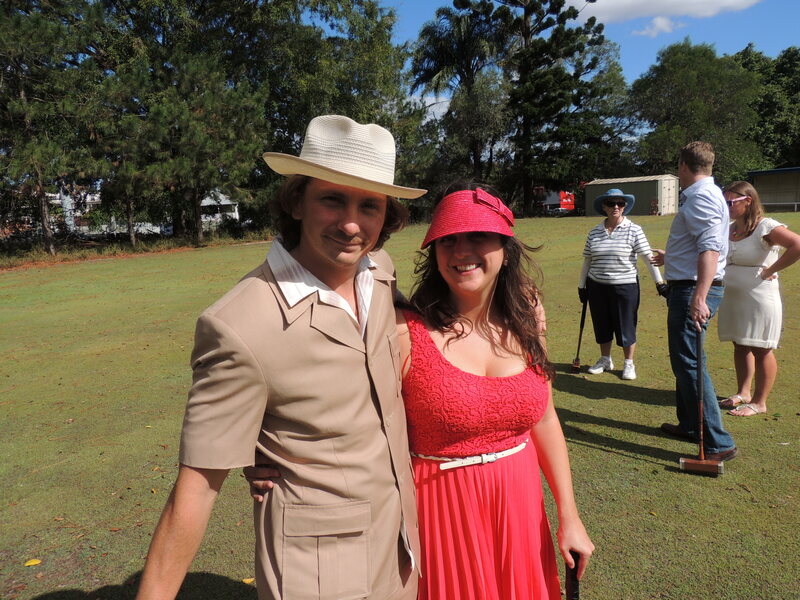 “You must come dressed in your croquet best, be it 20’s, cricket whites, bowler hats or pipes – I don’t care. Dress to impress my bloomers off.” Now, that to me sounded like a challenge. 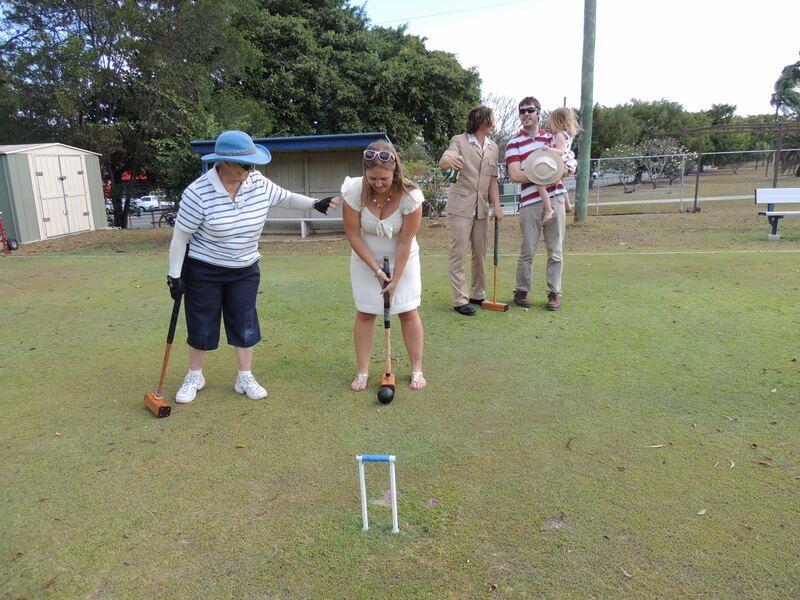 The day was hosted at Stephens Croquet Club in Annerley. 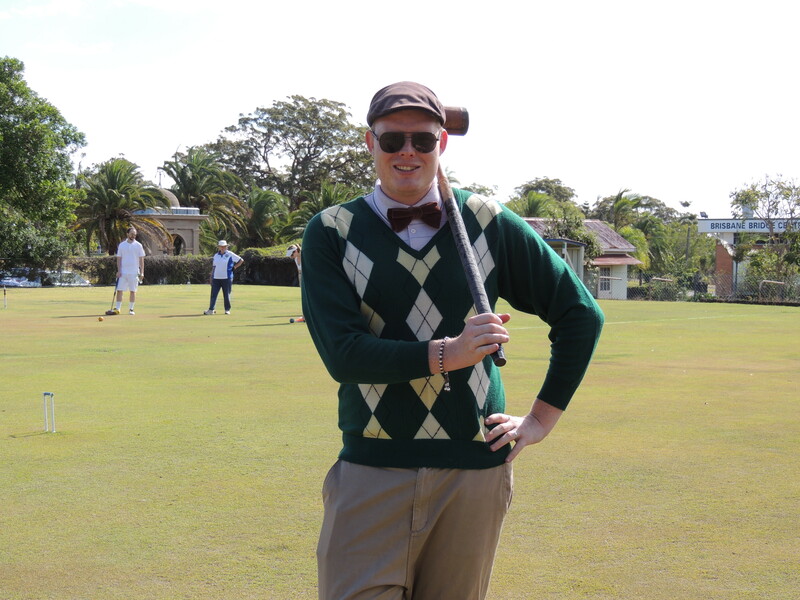 Yes, croquet clubs actually do exist. In fact, Stephens was just one option of a few in the area. Seriously. But I couldn’t be more pleased with our experience. When we first arrived 4 elderly people were sat out front on the bench welcoming us. My initial thought was that these poor people are here for their Sunday regular, and they’re going to be disappointed when then find a rambunctious birthday party ruining their quiet tradition. But that was not the case. 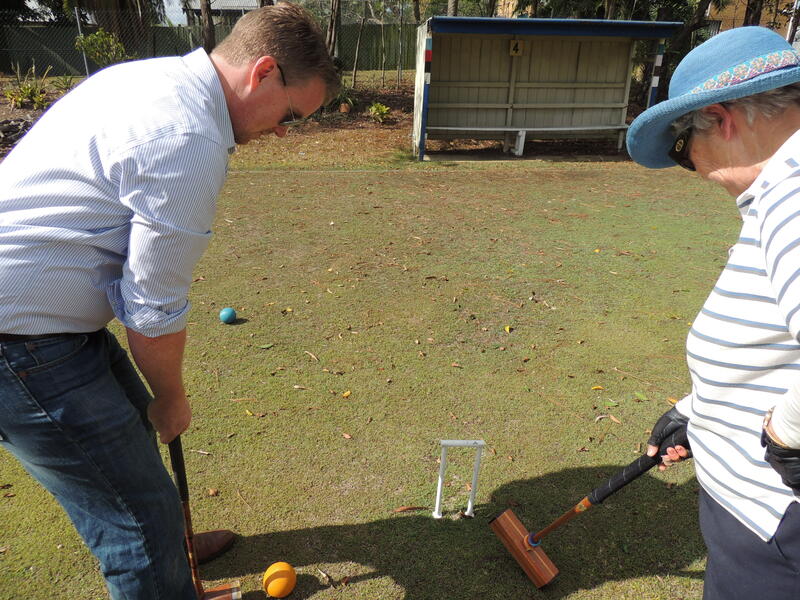 For $15 each person got a go at a game of croquet. Before we got started one of the gentlemen from the Club asked everyone to gather round as he explained how the day would work and we’d all get a chance to play what he pronounced ‘croke-e’. The Club grounds were divided into four courts, with four people playing at each so a total of 16 people could play at once. The four lovely people who were seated outside the Club when I first arrived in fact were volunteers for the day. Each took a group of four over to their designated court and walked us through a simplistic version of an abridged game. My group of four was split with myself and fellow New Jersian Noble on a team playing against Louise and birthday boy John on the other. Our instructor Gail, explained how we work the arches around the four corners of the court first, before moving into the two center arches and finishing by hitting the ball against the wooden stick in the very center. She then explained that the balls go in order of blue, red, black and yellow alternating teams and John being the birthday boy won the coin toss and got to go first. With a few practice swings of holding the mallet between our legs and giving it a good wack, we were on our way. I have to give a special shout out to Gail who strategically worked us through various techniques. In fact, our game lasted about 2 hours, the longest of the day as two or three other games finished by the time my group got through one. Sad to say Noble and I lost, but luckily we got one in through the arch at the very end. 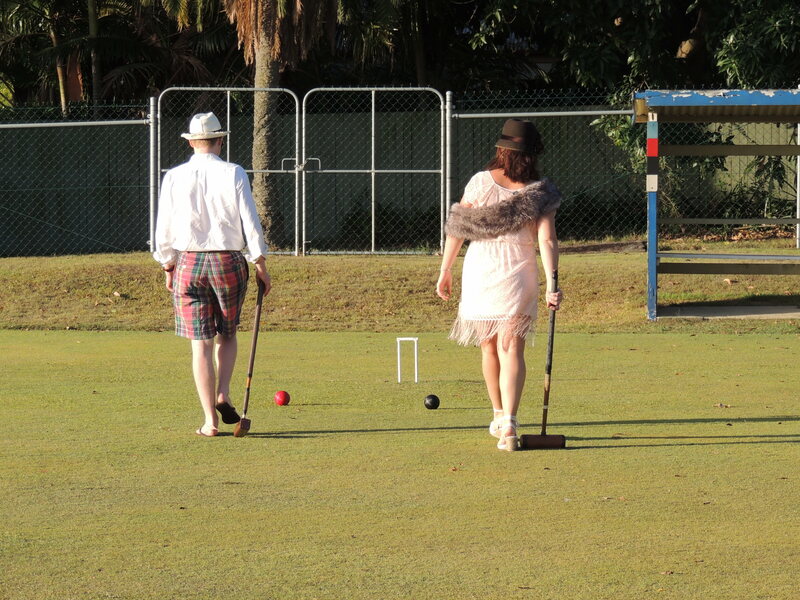 Gin, birthday cake, sausages on the grill and outfits ranging from all whites with suspenders to visors and colorful frocks, I found a new appreciation for a sport I never thought I’d play – croquet. Love it! What a fab Birthday idea. Cute dress, too Sis. Love ya.